More than 1,000 people got "pie faced" and broke a world record for the largest shaving-cream pie fight. The 1,186 people taking part exceeded the 869 holders of the current record. The fight took place at the annual Another Fine Fest in Ulverston, held in honour of comic actor Stan Laurel, who was born in the town. 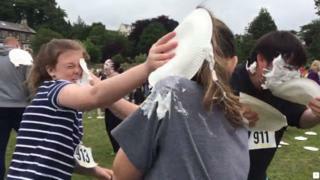 Ceri Hutton, from Team Pie, said it was "a moment of pure joy when the pies started to fly". "Just the sound of over 1,000 people squealing and laughing," she said. "It's only right that Ulverston, birthplace of comedy legend Stan Laurel, should hold this record." Organisers have to send evidence to Guinness to confirm the new world record, they said. They said they were confident of validation having followed official counting protocol with a "huge electronic turnstile" and thrown nearly 3,000 pies of the regulation size of 16.5cm (6.4") for one minute. The previous record was set in Belfast in 2015.